When my brother was chef-ing at a Michelin starred restaurant in central London, he had to turn out up to 200 pieces of salmon every night. Suffice to say, he avoided salmon when he could. I, on the other hand, would be happy to live on salmon for the rest of my life – were I forced to choose one type of protein. Raw, poached, grilled, fried…any which way – provided it was fresh. 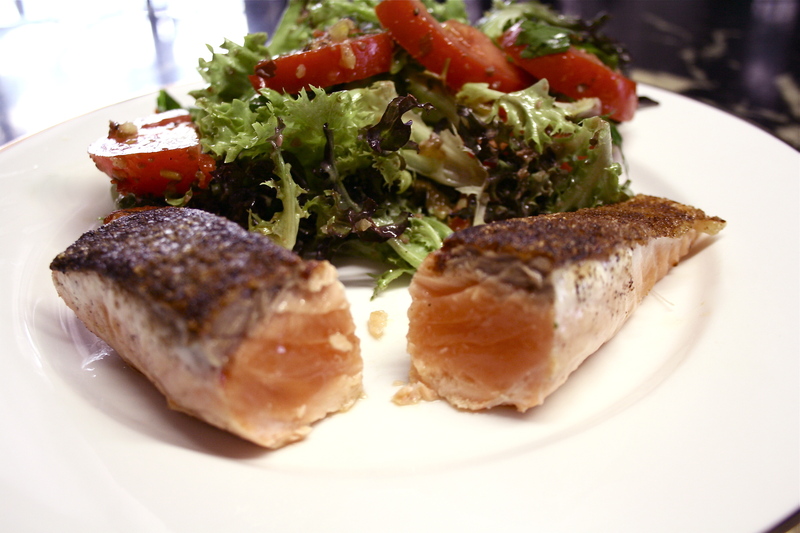 Despite our disconnect, I often serve salmon whenever my brother comes over for dinner – partly because it’s easy and – ok – partly because it’s a cruel bit of sisterly love. 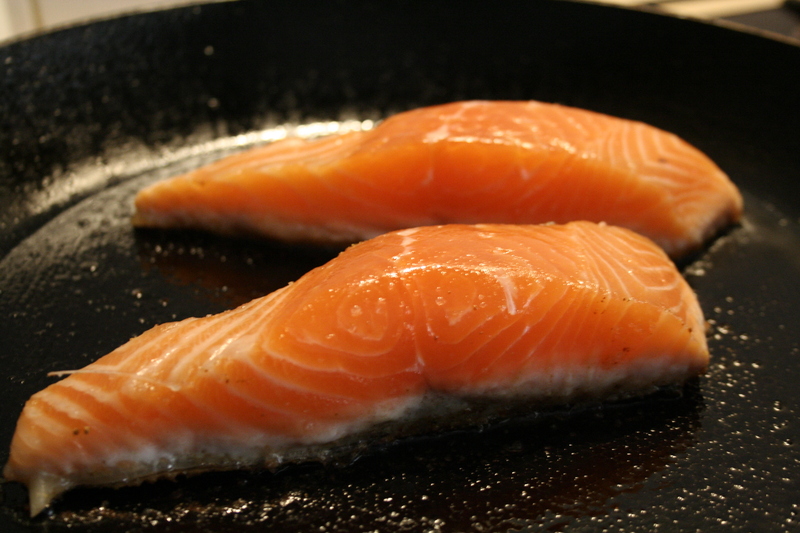 Aside from my lack of originality for his benefit, he often was frustrated at my hit and misses when I made crispy skinned salmon in particular (my favourite, his uneasy nostalgia). So – finally – he recently grabbed the pan from me and showed me how to do it properly – every time. So here are the tips I learnt from him…. 1. You must use oil. Even if you’re using a non-stick pan. I argued with him a long time on this one, because I wanted to keep it healthy. I lost the argument – but a tablespoon-full is enough for a medium-sized pan. 2. Keep the heat at a medium-low temperature. If you need to experiment on your stove-top, start low. If it’s too hot, you’ll char the skin – which you don’t want to do. 3. Sprinkle salt onto the skin and place the fish skin side down first. Most of the cooking should be done on this side – this is VERY important! (You should turn the fish once only – see #4 below). As the fish cooks, the flesh will change to a lighter colour. I like my fish with the skin very crispy and the flesh rare. In fact, anything more than medium rare, I consider over-cooked and sacrilegious (but I suppose we all have different faiths, so each to his own!). For rare fish, I would let the flesh change colour to no more than one-sixth of the way up the thickness of the flesh. If you like your fish medium rare then aim for one-third of the thickness of the flesh. Cook the fish skin side down. Watch the flesh change colour as it cooks. 4. Once you reach the desired level per step 3, turn the fish over so that the skin faces upwards and cook for no more than one minute on the other side – do not turn the fish over any more, do not collect 200, do not pass go. If you even think about turning it again, I will personally clobber you over the head with the pan. Once the minute is up – serve! Just the way I like my salmon and good tips from your brother. I’m so pleased it’s not just me:) Thanks for popping by!